I spent the tenure of my JET years in Osaka prefecture in a small city northeast of the prefectural capital. Since this blog is going to be quite personal, out of respect for everyone's privacy, I'm not going to make it easy to discover the name of my town or my school - I taught at, let's say OO High School, a high-level school with a specialized English stream to help students get into a good university. 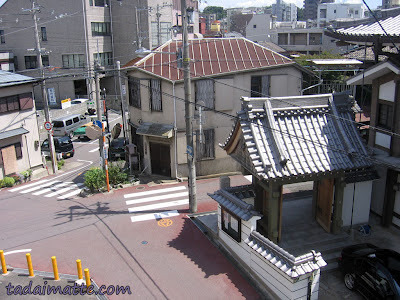 My city was a beautiful little spot, and although I complained from time to time about how far it was from things I wanted to do in Osaka city itself (frequent trips to Minoo, one of the nicer hot springs in Osaka, were out of the question), it really was a wonderful place. I lived less than 5 minutes from a train station, a grocery store, 4 convenience stores, a park, my bank and a fantastic takoyaki shop. School was 12 minutes' bike ride away. OO City had a population not too far off from my own hometown, so the size was comfortable for me, and living on the Keihan Line was great. Both Osaka and Kyoto were easily reachable. We had a grocery store in town that sold passable import food, and while my apartment was smaller than I had initially imagined, it was clean and bright. I also had a JET neighbour who moved in a week before I did and almost instantly became the best friend I could ever have asked for in Japan. In fact, she's still there, but I'm looking forward to welcoming her back to the West this summer. I struggled with homesickness and heartbreak during my time abroad and it was this difficult period that made me realize that I was not, in fact, destined to spend my life there. There are so many ways things could have gone differently; if I had studied more, or if I had visited home more, perhaps I would still be there now too. I quickly found that my homesickness for Japan was worse than my homesickness for Canada - that of course was how this blog came about. Most "lifers" would probably laugh at my short experience, too - many of the NETs working for the Osaka Board of Education had been there a decade or more. I think my biggest problem was that I wanted so badly to stay - but the combination of things on my mind was so much that I knew I had to leave, for my own health. Still, I'll always consider Osaka my second home - were it not for those few crucial factors here, I would go back in a heartbeat.